Every May, the fashion world of NYC comes together for the Costume Institute Met gala. 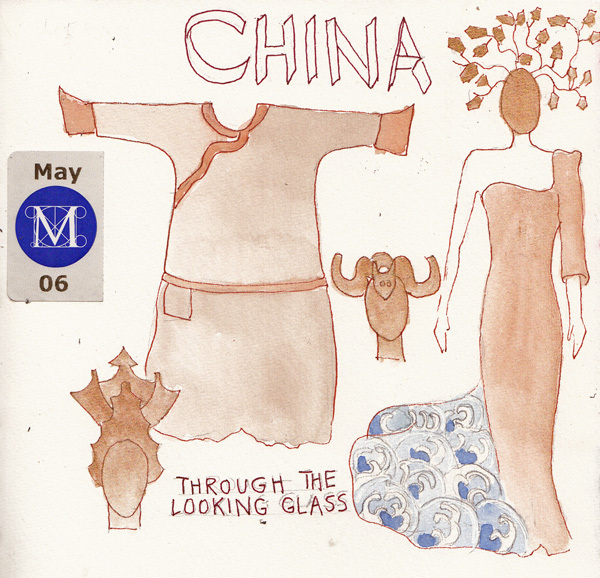 This year the exhibit is China: Through the Looking Glass. It is the most extravagant fashion exhibit I've seen there, in part because the exhibit is both in the Costume Institute galleries, and throughout the Asian Galleries. It took us 2 hours to go through the galleries (even without reading many labels!). And I did just a few sketches to remember the event. This is a wonderful Met video of the exhibit. Pat, Benedicte, and I also went to MoMA to see the new Warhol exhibit, and to attend the first of many sessions about Warhol's Materials and Methods -something they are calling Warhol's Pop-Up events. A museum art educator discussed Warhol's career and led us through 2 exercises. In the first, we used one of his iconic shapes and created a new product/brand/logo. I created a shopping bag, with an extravagant hat on it, for my store called "To the Races." I imagined a shop for hats to be worn to the Kentucky Derby and Ascot. For the 2nd exercise, we were given stacks of ads from the 1950s-1960s (I think) and a light box, and asked to trace images from these ads to create a new ad. 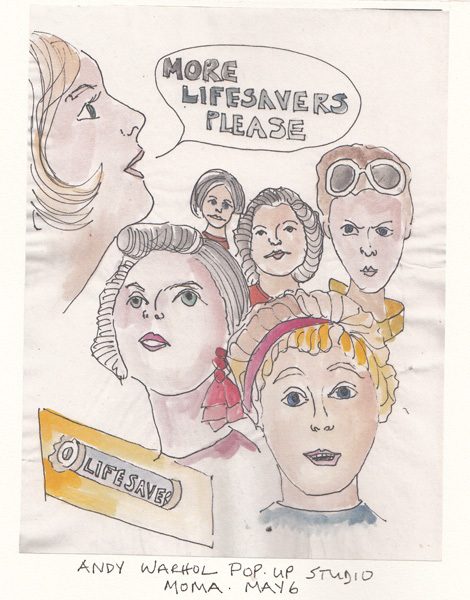 I just collected women's faces and made it an ad for Lifesavers - a hint at the rise of feminism during that time. Warhol is not an artist I admire. I keep looking for evidence that he did more than transform work by others. But it is always fun to work with the MoMA educators and I probably will sample one session from each of the 4 who will be leading these sessions in the next few months to see how they differ. I am still doing daily drawings from my imagination as part of a 100 day Drawing Project. Some days I have to just draw a squiggle and go from there, and they are mostly dreadful drawings. Other days ideas flow as I'm drawing and these silly little people appear. I drew a table and added the "patient." Then I decided it must be a physical therapy session and added the therapist and the room details. 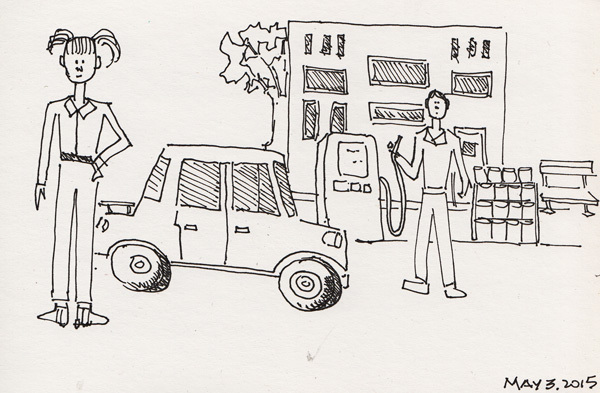 I started out drawing a car, and then wondered where it was, and a gas station materialized. 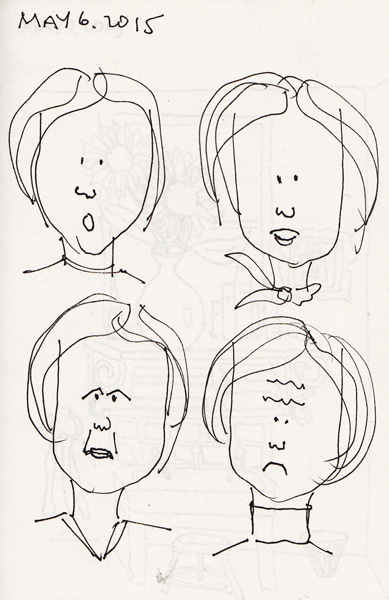 Are these cartoon faces able to express emotions? 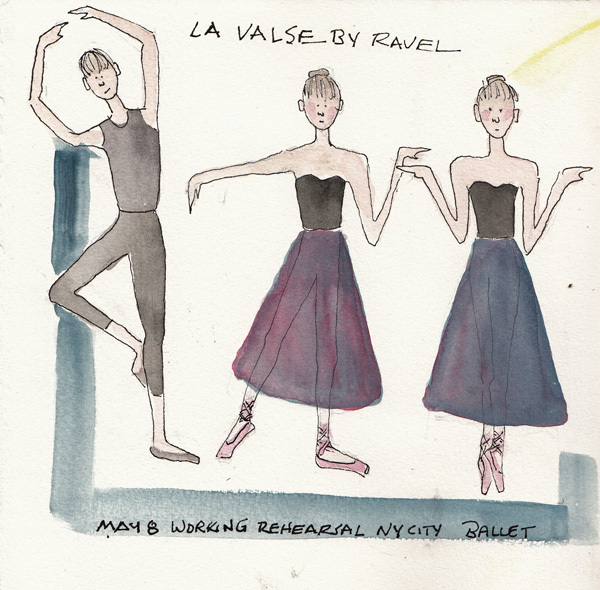 Last Friday I went to a "Working Rehearsal" of the New York City Ballet and did a few quick sketches from the Mezzanine before the lights went down too low to see my sketchbook. I just redrew what I remembered and the 3 dancers morphed into my imaginary people! 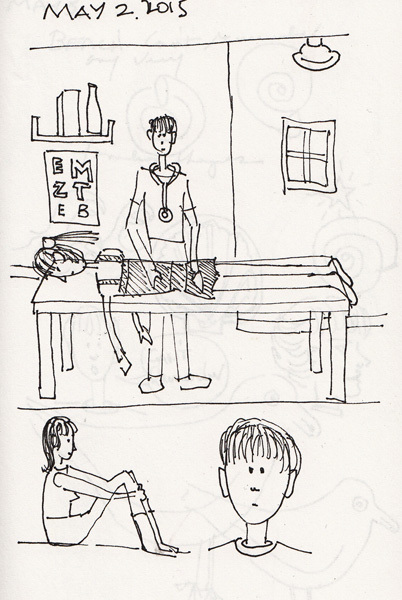 I'm having fun drawing from my brain to my tiny notebook and will periodically show a few drawings here on my blog. But it is hard work! And I really need an encyclopedic store of images in my brain from what I drew previously. 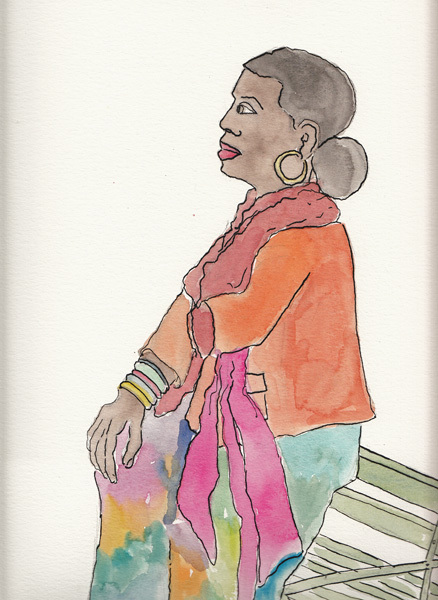 There is a free, outdoor Figure Drawing session in Battery Park City at the tip of Manhattan every Wednesday afternoon from May through October. Yesterday was the first session, and many of the artists, and the model, were old friends. The model is Donna - an incredible, colorfully dressed, experienced model. 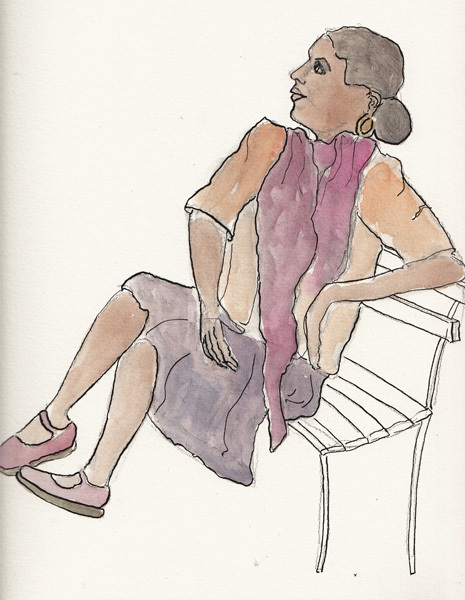 I prefer the younger models who are dressed in tank tops and leggings so I can draw their full posture, but yesterday Donna was dressed in so many layers and colors that I had to pull out my watercolors for the longer poses. This is the 5 minute sketch - in graphite. There were also two 10 minute sketches and one 30 minute sketch, which I did in graphite and then added paint. But I missed the lines after painting, and brought them home and added India ink lines with my flexible nib over the watercolor. Over and over I find that line is the most important element for me in art. I prefer drawings to paintings, and ink and watercolor to any other paint medium. And among oil paintings, I gravitate to the paintings with definite black lines in the paintings, like Matisse and Beckmann to name a few of my favorite artists. 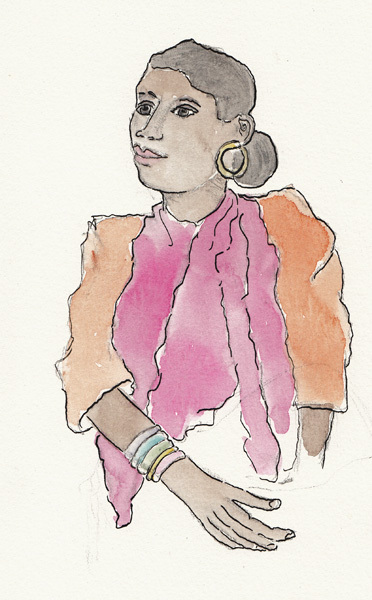 For this 30 minute pose Donna added yet one more scarf, a deeper auburn color over her bright pink one. Her dress was a multicolor print and I simplified it to only capture the colors. It is a solid piece of plastic with 10 wells and it easily and snugly fits into the Altoid-type tin that Teri bought for us. 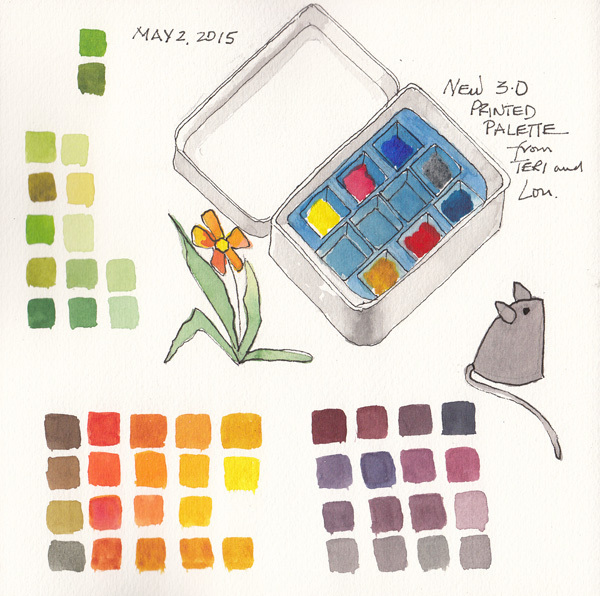 I loaded up my new palette with Schminke Aquarelle paints. After several years using Winsor Newton artist grade watercolors, I decided to try Schminke based on multiple recommendations. But I was used to my regular WN primary color triads to mix colors, and set the new tubes aside. So they were perfect for this new small palette. This weekend I took them into Central Park just to enjoy the weather and do some mixing studies. I always use primary triads and mix the secondary and complementary colors - but also have Winsor Newton Neutral Tint, Van Dyke Brown, and Lamp Black in my palette "for convenience." I really like the range of colors that I got from mixing these primaries and will probably add a brown and black to the 3 empty wells to complete this pocket size palette! We are still drawing with dip pens and ink washes, and I really enjoy it. Others in the class have gone back to graphite, although he is also recommending that we try Conte crayons. My experience in figure drawing class convinced me that charcoal and Conte crayons would never be among my favorite media, so I'm thrilled to continue with ink and my Brause steno nib. 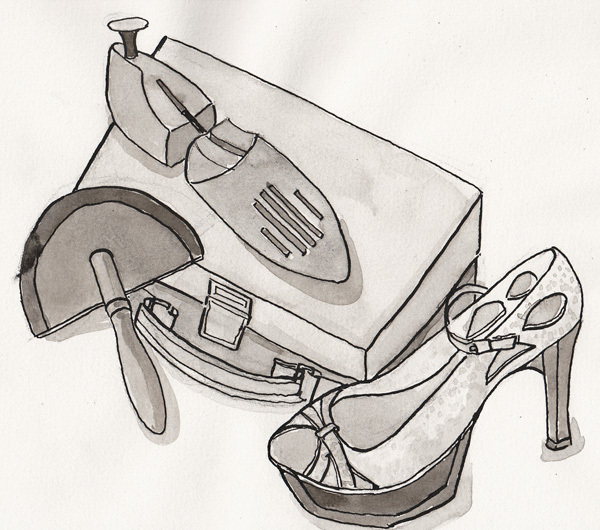 I assembled this Shoe still life when I arrived in Drawing class last week, so I could have it on my desk to draw. Our professor usually puts props on a table in the center of our desks, 8-10 feet away, and although I don't need glasses, I do like to see more details. 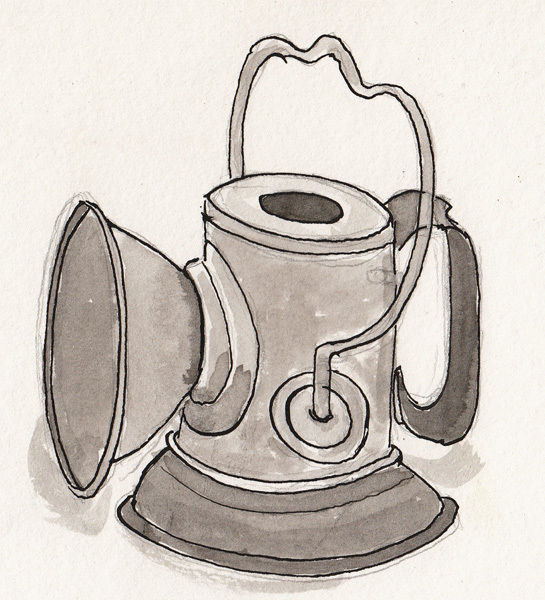 I selected several other props for two more drawings - a plaster sculpture missing a foot (but I added it) and a metal lantern that had a great shape. Two more weeks, and then I can say I've taken one college figure drawing class and one drawing class - and proceed on my own as usual. Sketchbook Skool Semester 4 is delightful so far - Jonathan Twingley, Lapin, and France Belleville Van Stone.